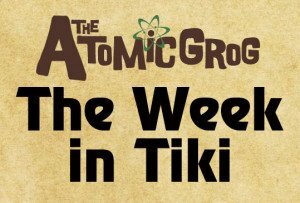 Aloha, and welcome to a new feature on The Atomic Grog spotlighting the latest news and information on the Polynesian Pop revival and wide world of retro-themed entertainment. Every Monday, look for a new blog post that previews what’s coming up and looks back at the highlights of the previous week. The Week in Tiki will attempt to cover all the major happenings across the world, with a focus on our home base, Florida and the U.S. East Coast. In keeping with the theme of the blog, look for updates on events, music, art, cocktails and culture, along with our obsession with Disney World. We’ll also celebrate our favorite spirit, rum, and spotlight a different cocktail recipe every week. Sit back, relax … and enjoy! It was a very busy week in the Tiki universe. Here’s a look back at the highlights. Click here or scroll down for info on how to keep us in the loop. It’s time to book your room and secure your tickets for the 14th annual gathering of Polynesian Pop devotees in Fort Lauderdale on June 10-14. 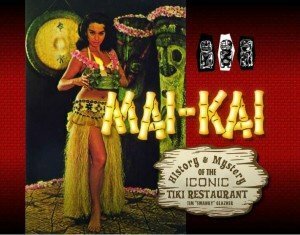 A new, temporary website launched on Tuesday (Jan. 13) with an impressive lineup of symposiums covering an assortment of fascinating mid-century icons, such as Disney World’s original Polynesian Village Resort (by Disney artists Kevin Kidney and Jody Daily), Florida’s Tiki Gardens, and Southern California’s Pacific Ocean Park. In addition, Tiki cocktail historian Jeff “Beachbum” Berry will join forces with New York City’s Brian Miller to present an in-depth analysis of the Planter’s Punch. Also announced was an entertainment lineup featuring some new (Alika Lyman Group) and old (The Intoxicators, Marina the Fire Eating Mermaid) faces. The Hukilau will be hosted for the first time by the Hyatt Regency Pier 66 hotel, with additional events at the venerable Mai-Kai restaurant. Coming soon, more details and tickets for a”Tiki Tower Takeover” by Berry, Miller and two other stars of the modern cocktail scene: Martin Cate (Smuggler’s Cove) and Paul McGee (Lost Lake). The special event will take place on Thursday, June 11, in the hotel’s 17th-floor, revolving Pier Top Ballroom. With thousands of rum fanciers and industry experts expected to descend on South Florida on April 17-19 for the seventh annual Miami Rum Renaissance Festival and International Trade Expo for Rum, it might be a good idea to make your plans now. It was announced last week that tickets and hotel rooms can now be secured through the official website, MiamiRumFest.com. Organizers Robert A., Robin and Robert V. Burr warn that the host hotels have sold out all rooms in advance for four years straight for the world’s largest gathering of rum producers, professionals and consumers. For the third straight year, the rum fest will return to the Doubletree by Hilton Miami Airport Convention Center, where the future availability of Cuban rum is expected to be a hot topic. 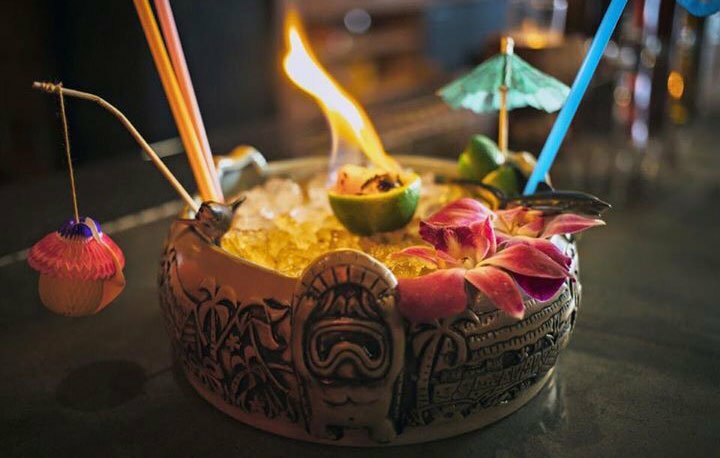 Acclaimed Tiki barman Paul McGee’s newest creation, Lost Lake, opened last week in the Logan Square neighborhood of Chicago. [See story and photos from DNAinfo Chicago] You can enjoy more than a dozen of McGee’s creative cocktails while sampling Asian fare from the attached Chinese takeout restaurant, Thank You. McGee, best known for his previous bar: the award-winning Three Dots and a Dash, has also brought in Martin Cate of San Francisco’s Smuggler’s Cove to curate a list of some 275 rums. The retro decor is suitably tropical, including a fish tank filled with skulls and live piranha. With Tiki seemingly making a big comeback in the Windy City, the Red Palms Chapter of the Fraternal Order of Moai last week announced the return of the Chicago Area Tiki Tour on April 24-26. The group promises a fun-filled ride across the Windy City hitting the best Tiki joints the Chicago area has to offer. Information about ticket sales, the host hotel, and itinerary is coming soon. In 1975, Tomorrowland in Walt Disney World’s Magic Kingdom added two attractions that are now among the most iconic in of all the Disney parks. On Jan. 15, the original Space Mountain began thrilling guests with a ground-breaking indoor roller coaster that later was added to Disneyland (1977) and three other parks around the world. The space-age structure with its retro-futuristic design is now the oldest operating coaster in Florida. 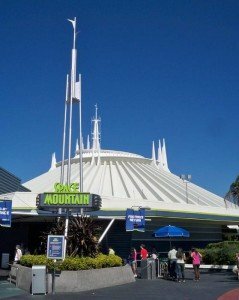 The genesis of Space Mountain can be traced back to Walt Disney himself in the 1960s, but it wasn’t until the early ’70s that the technology became available to make it a reality. Even more historic is Walt Disney’s Carousel of Progress, an attraction built for the 1964-65 World’s Fair in New York City and later moved to Disneyland. It made it’s final move in 1975, opening at the Magic Kingdom on the same day as Space Mountain. The 50-year-old marvel of imagineering features a ground-breaking revolving theater and is one of the earliest examples of Audio-Animatronics (along with the Enchanted Tiki Room). The Carousel was a pet project of Walt Disney, who can be seen in a video in the queue. It’s also considered the longest-running stage show, with the most performances, in the history of American theater. As reported here last week, Disney’s Polynesian Villas & Bungalows were made available to current members of the Disney Vacation Club. Sales to prospective new DVC members begin Feb. 9. If you buy now, the contracts last for 50 years. The first phase is scheduled to open April 1, hopefully along with the much-anticipated Trader Sam’s Grog Grotto at the recently renovated Great Ceremonial House in the resort on the shores of Seven Seas Lagoon outside Walt Disney World’s Magic Kingdom. [See previous coverage] For more info, check out this new article on Tikiman’s Polynesian Village Resort website and follow the Facebook page. Tonight (Jan. 19) in New York City, Tiki barman extraordinaire Brian Miller returns with his latest cocktail event at Pouring Ribbons. The modern-day pirate promises to warm your cockles with drinks featuring sponsor rums El Dorado and Plantation, plus all his usual shenanigans for the Big Apple’s thirsty Tiki-loving rogues, scallywags and rapscallions. Meanwhile in the Sunshine State, Florida’s tropical climate allows for festive indoor-outdoor Tiki-themed events even when the most of the rest of the country is hunkering down with a Hot Buttered Rum. On Saturday (Jan. 24), there are two to choose from: In Fort Lauderdale, Kreepy Tiki Lounge hosts Revenge of the Tiki lV, featuring 26 bands (Wayne Hancock, The Independents, et al.) and a burlesque show by Morgan La Rue and The Shimmy Shake Revue. This all-day event (noon to 3 a.m.) will also include include DJs, a car show, food, and loads of vendors of vintage merchandise (The Modern Historic, Tortuga Tile Works, et al.). 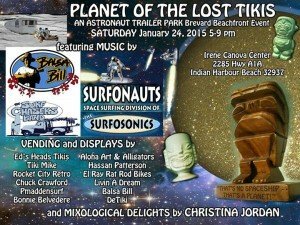 At the oceanfront Irene H. Canova Park in Indian Harbor Beach, Astronaut Trailer Park will be hosting Planet of the Lost Tikis. Starting at 5 p.m., the beachside event will feature live surf music (Surfonauts, Balsa Bill and The Surfchasers, etc. ), Tiki cocktails by Christina Jordan of the Straw Hat Barmen, artists and vendors (Ed’s Heads, Rocket City Retro, Hassan Patterson, DeTiki, et al. ), live Tiki carving, and more. Do you enjoy kitchy films with your favorite tropical libations? Luckily, so does the Miami Rum Festival’s Robert V. Burr, who has brought back his vision of a perfect night at the movies on a grand scale. 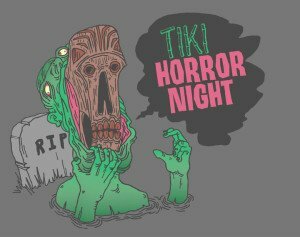 The new Tiki Horror Night comes to the Blue Starlite Mini Urban Drive-In in Miami beginning this Thursday (Jan. 22) at 7 p.m. Think of it as a mash-up of Mystery Science Theatre 3000 and Tiki Bar TV. Burr and co-organizer Andrew Lazo will provide snarky commentary while the nearby Taurus bar will provide the drinks. A different movie is lampooned every two weeks. 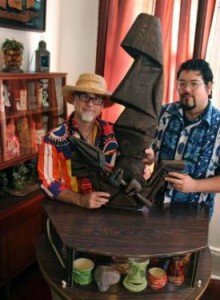 The godfather of artistry in the late 20th century Tiki revival, Bosko Hrnjak was the first major new figure in the art community to revive the lost mid-century crafts of carving and mug-making. In the decades since, his works have been shown in galleries around the world, and he’s become a much sought after interior designer. When it came time to create his long-awaited New Orleans Tiki bar, Latitude 29 in the Bienville House Hotel, Jeff “Beachbum” Berry recently turned to his old friend from California to provide an array of idols, molding and structures, including 8-foot-high carved poles. * Visit him at TikiBosko.com. Tiki cocktail and rum bloggers come and go. Then there is Helena Tiare Olsen. Based far from the tropics in Stockholm, Sweden, Olsen has created her own Tiki paradise as a longtime rum connoisseur and Tiki cocktail enthusiast with a colorful flair for covering her passions like no other independent voice in today’s spirits scene. Her blog, established in 2008, is a visual feast that lures you in. Then, after you sample a few of her recommended rums and cocktail recipes, it becomes an intoxicating feast for all your senses that you’ll want to return to again and again. 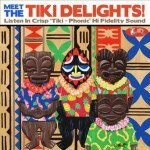 The brainchild of Nashville singer/songwriter/author Darren Long, the music of The Tiki Delights is indeed a delight. The self-titled six-song EP (released in August 2013 on CD in addition to digital download) is a loving tribute to the classic exotica sounds of the 1960s. Written and produced by Long, the songs also feature other influences such as surf, hapa-haole, bossa nova, and Spaghetti Western. Among the five instrumentals and one vocal tune, my favorites are Scorpion Rider, Bali Safari, and Stormy Outrigger. Like any good exotica album, there’s also some outstanding cover artwork by prolific California artist Eric October. 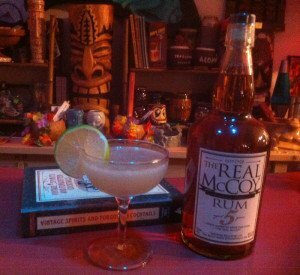 I was introduced to The Real McCoy’s 5-year-old rum at the 2013 Miami Rum Festival, shortly after its debut. I was impressed by this smooth gold rum with hints of caramel, toffee and spice. It quickly won multiple awards at rum festivals around the world, and I quickly learned that it’s a great mixer in Tiki cocktails. Distilled in Barbados by Sir Richard Seale at Foursquare and bottled in Connecticut, the rum also has one of the most fascinating back-stories. Named in honor of famed Prohibition-era rum-runner Bill McCoy (and distributed in bottles that harken back to that time), the rum is the brainchild of filmmaker Bailey Pryor. It grew out of his fascination with the subject while making the Emmy award-winning documentary film The Real McCoy (2012). 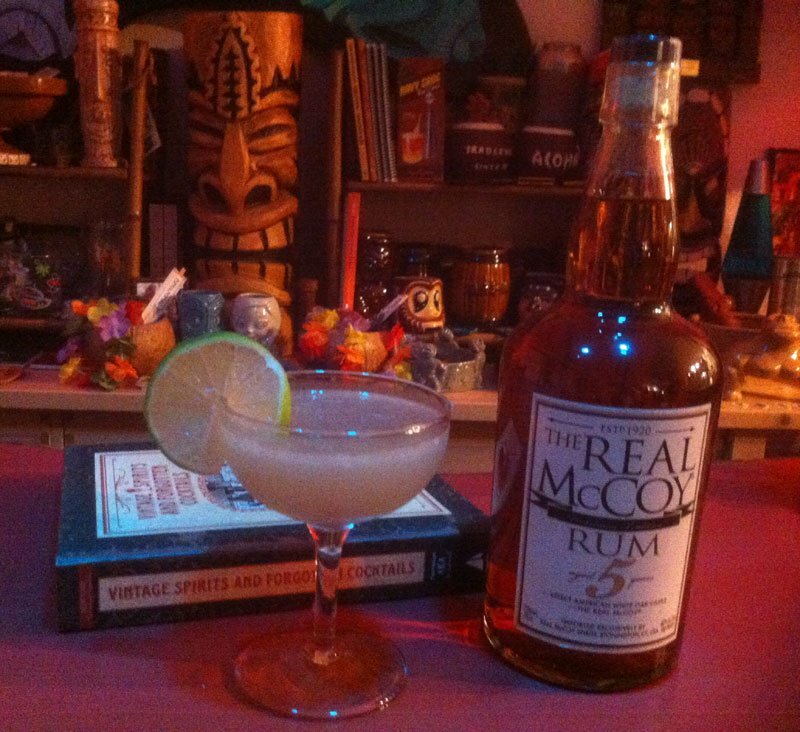 The Real McCoy line also includes a 3-year-old white rum and 12-year-old aged rum. More at RealMcCoyspirits.com. Blend with crushed ice until smooth. Serve in a saucer cocktail or champagne glass. Garnish with a lime wheel. * Feb. 20 – The Art of Tiki: A Cocktail Showdown, South Beach Wine & Food Festival, Miami Beach. Featuring Emeril Lagasse, Jeff “Beachbum” Berry, Martin Cate. * Feb. 28 – Rockabilly Ruckus at Skipper’s Smokehouse, Tampa. * March 14 – Dapper Day at Disney World. * Oct. 1-3 – Ohana: Luau by the Sea, Fort Lauderdale. A weekend of ohana in sunny South Florida. * May 15-17 – Instro Summit, Chapel Hill, N.C.
* June 25-28 – Ohana: Luau At The Lake at The Tiki Resort, Lake George, N.Y.
* July 15-19 – Tales of the Cocktail, New Orleans, La. * Feb. 12-22 – Modernism Week, Palm Springs, Calif.
* March 1 – Dapper Day at Disneyland. * April 11-13 – Mojave Oasis, Newberry Springs, Calif.
* May 14-17 – Tiki Caliente, Palm Springs, Calif.
* July 10-12 – Tiki Kon, Portland, Ore., and Vancouver, Wash.
* Aug. 13-16 – Tiki Oasis, San Diego, Calif.
* May 23-25 – RhumFest Paris, Paris, France. * June 18-21 – Surfer Joe Summer Festival, Livorno, Italy. 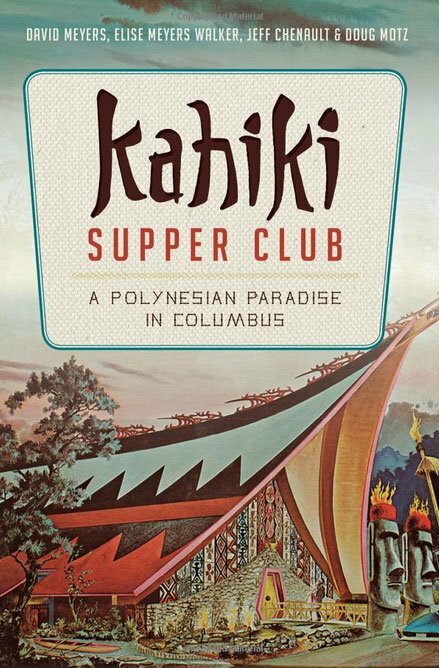 A professional journalist and Florida resident for more than 30 years, Jim "Hurricane" Hayward shares his obsession with Polynesian Pop and other retro styles on his blog, The Atomic Grog. 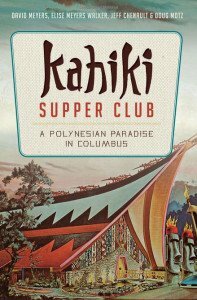 Jim's roots in mid-century and reto culture go back to his childhood in the 1960s, when he tagged along with his parents to Tiki restaurants and his father's custom car shows. His experience in journalism, mixology, and more than 20 years as an independent concert promoter make him a jack-of-all-trades in the South Florida scene. A graduate of the University of Florida's College of Journalism and Communications, Jim is a longtime web producer for The Palm Beach Post. In his spare time, he has promoted hundreds of rock, punk, and indie concerts under the Slammie Productions name since the early 1990s. In 2011, he launched The Atomic Grog to extensively cover events, music, art, cocktails, and culture with a retro slant. Jim earned his nickname by virtue of both his dangerous exotic drinks and his longtime position producing The Post's tropical weather website. 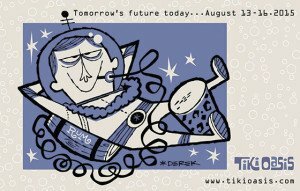 This entry was posted in 2015, Attractions, Cocktails, Culture, Disney World, Events, Events, History, Hukilau, Magic Kingdom, Music, Other Florida, Recipes, Resorts, Rum, Rum festivals, South Florida, The Week in Tiki and tagged A Mountain of Crushed Ice, Beachbum Berry, Bosko Hrnjak, Brian Miller, Carousel of Progress, cocktails, Disney World, Disney's Polynesian Village Resort, Fort Lauderdale, Hukilau, Kevin Kidney, Kreepy Tiki, La Floridita Daiquiri, Latitude 29, Lost Lake, Marina the Fire Eating Mermaid, Martin Cate, Miami Rum Renaissance Festival, Paul McGee, recipe, Robert Burr, rum, South Florida, Space Mountain, Steve Yamada, surf, The Intoxicators, The Kahiki, The Real McCoy Rum, Tiki Delights, Tiki Horror Night, Walt Disney World. Bookmark the permalink. Wow!! that was very kind words, mahalo nui loa! much appreciated! 🙂 and that this about me and my crazy blog was said by my favorite blogger makes it even better!